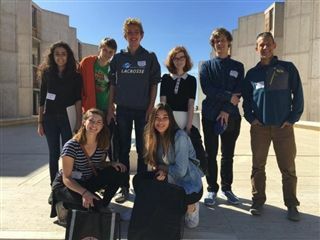 Middle School students in Ms. Nattrass' Social and Community Studies class may not be old enough to legally vote, but that didn't stop them from casting their ballots on Carlsbad's Measure A. On Tuesday, February 23rd, the class read analysis and arguments for and against the measure. Then they had the opportunity to speak with Carlsbad City Attorney Celia A. Brewer, author of the "Sample Ballot & Voter Information Pamphlet" Impartial Analysis. Students were excited to have a city official answer their questions and address their concerns, especially on the heels of a class unit on government and legislative process. Unlike the City of Carlsbad, the class voted to pass Measure A. But surely those on both sides of the fence could agree that fostering a new generation of educated, enthusiastic voters is a winning proposition!